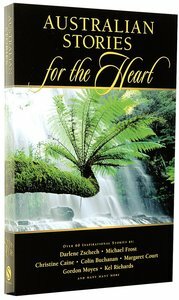 An inspirational collection of stories from popular Christian authors and leaders, including: Darlene Zschech, Colin Buchanan, Tim Costello, Margaret Reeson, Michael Frost, Christine Caine, Gordon Moyes, Phillip Jensen, Margaret Court, and Kel Richards. About "Australian Stories For the Heart"
Tim Costello is the head of World Vision Australia a charity that fights poverty and injustice. It is the largest charity in Australia and in 2010 it provided emergency relief to 3.2 million people around the world and food relief to 1.2 million. It ran programs to help people in poverty in 61 countries. As its charismatic and activist leader Tim travels throughout Australia and the world taking part in national and international debates on social justice issues as diverse as global poverty, gambling, homelessness, reconciliation and substance abuse. Tim's tireless leadership helped World Vision raise $100 million in Australia to assist tsunami relief. Tim was named Australian of the Year in 2004 and was awarded an Order of Australia (AO) in 2005. His previous books include Streets of Hope and Tips from a Travelling Soul Searcher. Christine is known for her tell-it-like-it-is, passionate, (and often humorous) way of communicating profound messages of hope and inspiration. Her message is impacting the lives of leaders, women, youth, the wider church and the unchurched across all continents. She is one of the pastors and directors of Equip and Empower Ministries, as well as the founder of The A21 Campaign. Together with her husband Nick, and daughters Catherine and Sophia, Christine spends much of the year travelling to reach the lost, strengthen leadership, champion the cause of justice and build the local Church globally. Margaret Court dominated the international women's tennis circuit in the 1960s and early 1970s. She is now the pastor of a thriving church in Perth, Western Australia. Kel Richards is a veteran Australian journalist, author and broadcaster, heard every weekday on Sydney radio. He is the author of a number of children's books - The Case of the Vanishing Corpse, The Sherlock Holmes Tale of Terror Series(4 vols), Moonlight Shadows, and Father Koala's Fables. Kel has also produced a hugely popular series of resources that present biblical truth using traditional Aussie vernacular and humour - The Aussie Bible, The Aussie Pigrim's Progress, Aussie Yarns, Aussie Christmas Carol, and Bush Ballads. His adult apologetic and evangelistic books include Forgiving Hitler, Defending the Gospel, Jesus On Trial, Journey Towards God, and Two Roads.